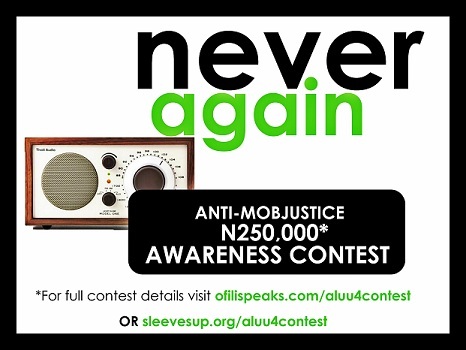 In a bid to raise awareness nationally about the nagging issue of mob justice, ofilispeaks.com and sleevesup.org are organizing an Anti-Mob Justice Awareness Contest to help spark the creation of media posters and radio jingles that can be used for a sustained nationwide campaign on this issue. October 5, 2012 was the day when four boys lost their lives to the senseless act of Mob Justice in Nigeria. Their deaths shocked our nation and sparked debate across the globe. Again 4 suspected robbers were also burnt to death in Mushin, Lagos by a mob crowd. These acts are a clear signal that there is still a lot to be done to eradicate the evils of Mob Justice from Nigeria. The objective of the #NeverAgainNG Anti-Mob Justice Contest 2012 is to create a National awareness among Nigerians in the community (village and city) about the dire consequences and evils of mob justice. The purpose of the contest is to garner a universal voice against Mob Justice and its various forms to the citizens of Nigeria. We hope that by focusing the creativity of many Nigerians on this particular problem…we would be able to cast a lasting blow to the practice of Mob Justice in Nigeria and potentially across Africa. Winning entrants both posters and jingle would be featured on National radio stations* and various print-media* as an ongoing campaign to sensitive Nigerians against participating or promoting mob justice. The #NeverAgainNG Anti-Mob Justice Contest 2012 begins on November 7, 2012 and ends on November 30, 2012 (the “Entry Period”). Names of contest winners will be posted on December 3, 2012. The contest is open to any Nigerian regardless of residence. Artists/Designers are allowed to submit any number of original Poster Entries, however, you may not submit the same Entry more than once. #NeverAgainNG Anti-Mob Justice Poster Contest 2012 reserves the right, in its sole discretion, to restrict participation in the #NeverAgainNG Anti-Mob Justice Poster Contest 2012 to any person at any time for any reason and/or to disqualify any entry at any time for any reason. Be 30 seconds or less. Be submitted in MP3 format. Submitted by Friday, November 30. One (1) grand prize will be awarded. The grand prize winner receives N100,000. Second place would win N35,000and third place would win N15,000. 1. Each Entry must be an original work that you have created that does not include material in which a third party has intellectual property rights. 2. The work should be created Poster size: 17” x 22” portrait or vertical oriented poster format. 3. Each Entry must not, in the sole discretion of the #NeverAgainNG Anti-Mob Justice Poster Contest 2012, be obscene, indecent, offensive, violent, hateful, or libelous, or contain any other content otherwise inconsistent with the purposes of the #NeverAgainNG Anti-Mob Justice Poster Contest 2012 as described in these Official Rules and related materials. 4. Each Entry must be available for poster reproduction at 300 dpi (CMYK) or greater for reproduction purposes. 5. *IMPORTANT* Each Entry must be submitted in JPEG (.jpg, .jpeg, or .jpe) or GIF format, size 17” x 22”, 72dpi and may not exceed 5MB. 6. Please do not enter promotional or advertising poster in the contest, these will not be accepted. For more information on participation, go to ofilispeaks.com. I am going to talk in my own jingle, i won't sing cos i can't but i can talk convincingly and engagingly. Least i have a passion for the aluu4. Their killings were senseless, and of course the poster.Look out for moi. I want enthusiasm and caring about causes just make a difference for an innocent man, woman, boy or girl out there. This is for you.